Guided by achievement data, student work samples, and teacher observation, the Learning Resource Center teacher will provide direct and explicit instruction to strengthen skills. 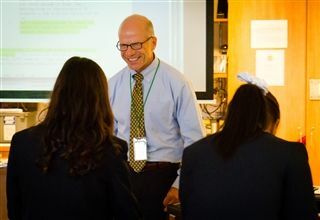 Through regular collaborations with classroom teachers, division directors, and parents, the LRC teacher will create specific and measureable goals and plans for each session. A Differentiated Educational Plan (DEP) is created and monitored for each student and includes background information, areas of focus, and recommended accommodations in the areas of environment, presentation of material, test administration, scheduling, classroom management, and homework. The Learning Resource Center, for a fee, offers numerous outlets of support to the student throughout the regular school day. Reading specialists trained in achievement assessment provide direct and explicit instruction for the struggling reader. The teacher-to-student ratio is typically 1:1 while student groups do not exceeding 1:3. *Some services are fee based. Students work with teachers one-on-one and in small groups. Homework Guides provide individual attention and re-teaching of skills as necessary. Homework Guides collaborate with classroom teachers and parents to determine if students are meeting the expectations of homework and if adjusted support is needed. For more information on Saint Patrick Catholic School’s Learning Resource Program, please contact the Learning Resource Coordinator at 550-4400 ext. 869. 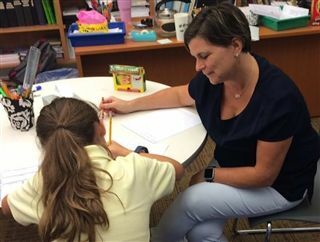 Saint Patrick Catholic School offers academic tutoring to help students achieve grade level expectations and competencies. Tutoring is provided by master level teachers who have specialized training or endorsement in reading, writing or mathematics and who have consistently demonstrated best practices in the classroom. Teacher to student ratios are no more than 1:2. During tutoring sessions, teachers provide direct instruction to strengthen skills specific to each child. Through collaboration with classroom teachers, the Learning Resource Coordinator, division directors, and parents, the tutor will create specific and measureable goals for each session. Students can enroll for tutoring services in one of the following areas: mathematics for grades 1-6, advanced math (pre-algebra, algebra, geometry) for grades 7 & 8, or reading and writing for grades 1-8. The number of sessions provided to each student is based on student need and teacher availability. Summer tutoring is also available through our summer program, Wolfhound Weeks.